My recent blogging has been like my life...not much going on (except work)! My first finish for 2011 is "My Maison". I just love this fabric line by French General. I scooped up a layer cake after Melisa returned from market last Spring. The pattern uses the Twister tools-large and small. As usual, Wild Willie is doing the inspection..although he has already been sleeping on it as I did the binding. The back is from a charm pack of the earlier French General line. Nancy of Blogging Near Philadelphia gifted me some pieces in a giveaway she had on her blog. Again, thank you Nancy. 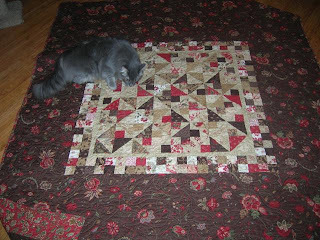 I did a Schnibble pattern for the center and surrounded it with some yardage. I need to pull myself up by my boot straps and get going. 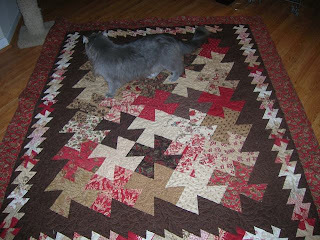 I need to make the quilt for the Morris Brandon raffle next month. Sue reminded me that it is that time again. Oops...I have the fabric and I even know exactly where it is...so that's a start.